This workshop is designed to help participants deepen their understanding of disorganized attachment and caregiving. The instructor will introduce how a particular type of high-risk attachment relationship is identified by researchers through observation of parent-child interaction, child doll play, a maternal interview and questionnaire. Disorganized attachment and caregiving will be contrasted with the various types of organized mother-child relationships. Video and interview material will be presented to demonstrate the use of attachment-based measures for clinical assessment and treatment planning. Participants will be encouraged to share their observations and clinical impressions of videos and transcripts. Register before February 21, 2019, and receive $99 early-bird pricing! Price increases to $115 after February 21, 2019. Judith Solomon, Ph.D., is internationally recognized for her pioneering research and training in attachment and caregiving, including the discovery and delineation of the disorganized attachment category and the first longitudinal study of infants in separated and divorced families. She has developed key measures of caregiving and child attachment, including the Caregiving Interview, the Attachment Doll Play Projective Assessment, and the Maternal Helplessness Questionnaire. 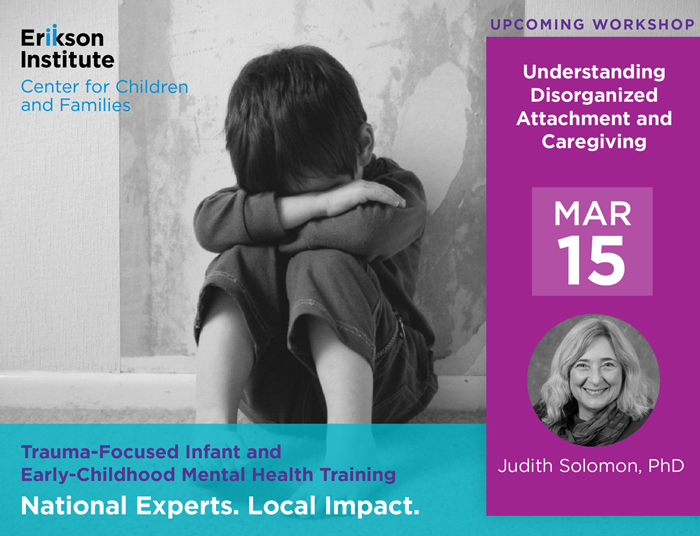 Dr. Solomon is the first editor of Attachment Disorganization, (Guilford Publications, 1999) and Disorganized Attachment and Caregiving (Guilford Publications, 2011). She is also a licensed clinical psychologist with expertise in the area of infant and early childhood mental health and parent-child psychotherapy. She received specialized training in Infant Parent Psychotherapy at the University of California, San Francisco and is the former Director of Clinical Training and Supervision of the Child FIRST program in Bridgeport, CT.